Lyft, Park, Ride, and Fiesta with VIA! 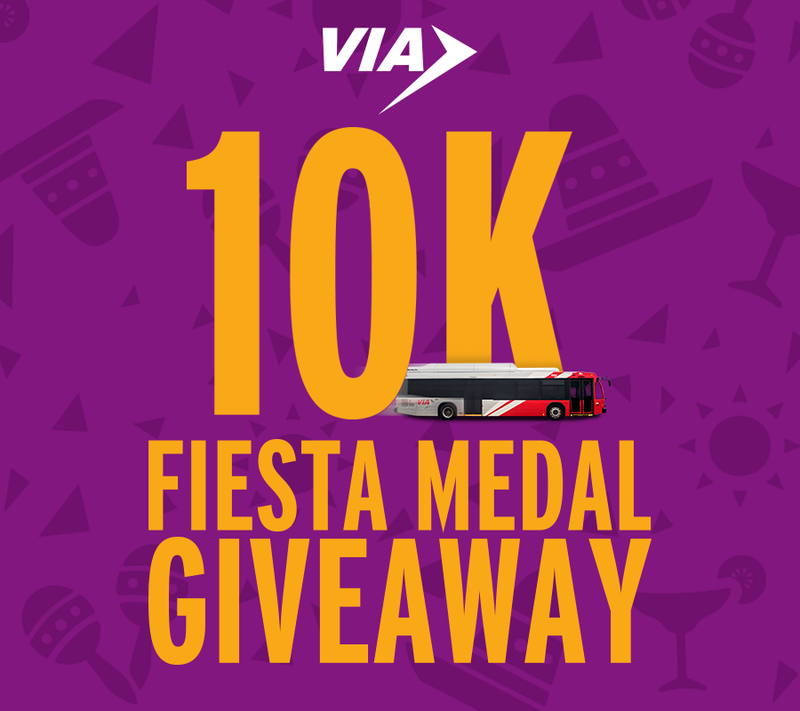 VIA kicked off the Fiesta 2019 season today with a Facebook Live announcement for its “10K Fiesta Medal Giveaway” and a new partnership with Lyft to promote drive-free travel to Fiesta events. Each year, VIA provides affordable, convenient Park & Ride Service to Fiesta favorites, including Oyster Bake, Taste of New Orleans, NIOSA and more. A complete list of Fiesta Park & Ride events is available online. Park & Ride customers will receive VIA’s 2019 Fiesta medal, while supplies last. They can also win a medal on VIA’s social media and through its pop-up prize patrol. This year, Park & Ride customers will also earn a $10 discount from Lyft through a new partnership to promote safe travel during the Fiesta season. VIA customers who take Lyft to their Fiesta Park & Ride location will be discounted $10 for the trip. They can pre-purchase their Park & Ride fare on the VIA goMobile app and skip the token line. Cash and credit cards are also accepted at the ticket booth. Lyft passengers can simply download the Lyft app and use the special promo codes: VIAFIESTA2019 (valid between 12 a.m. April 12, 2019 and 12 a.m. April 15, 2019) and VIAFIESTA19WK (valid between 12 a.m. April 22, 2019 and 3 a.m. April 28, 2019). Each code is valid for $10 off one trip to or from one of VIA’s designated smart hubs to include Crossroads Park & Ride, Randolph Park & Ride, Frank Madla Transit Center, and Airport Park & Ride. “We hope to make it easy for San Antonio to Viva! responsibly and encourage festival goers to leave their cars at home and take advantage of this first mile, last mile partnership which brings multimodal transportation solutions to the Alamo City’s biggest party of the year,” said Janet Peavy, Lyft San Antonio Market Manager. Park & Ride Special Event Service fare is $2.50 each way with discounts available for children, seniors, students, and active-duty members of the military. VIAtrans customers and children under age 5 ride free. VIA bus passes are not valid for this service. VIAtrans service will also be available to Fiesta for registered patrons. The usual VIAtrans reservation policies apply. Vist our Fiesta page for more information and complete list of VIA’s special event service to Fiesta events, or call (210) 362-2020. For more information regarding Fiesta, visit fiesta-sa.org.